Dr. Conner began his education at Napa Valley Community College in 1986 where he received three A.A. degrees in General Education, Natural Science, and Business Administration. He then went on to receive a B.S. degree in Liberal Arts from Reagents College of New York. After completing his undergraduate work in basic sciences he went on to attend Life Chiropractic College West in Hayward, California. During his three and a half years at LCCW, courses included biochemistry, a major emphasis on anatomy and human physiology, x-ray, diagnosis, chiropractic adjusting techniques and patient care in the LCCW public clinic during his internship. After receiving his doctorate degree in chiropractic he then decided to establish his practice in Solano County. When you want to find a chiropractor, you should learn as much as possible. A professional has a type of resume called a curriculum vitae. This document contains all of the academic information of the doctor and the purpose is to let the public know the training, experience, honors, and every vital professional statistic of that doctor. This document is key in understanding the knowledge base and experience of the doctor and allows the potential patient to make an informed choice of receiving the best care possible for their condition. View Dr. Conner’s credentials. Dr. Conner met his wife Teresa in 1991 and they were married in 2003. They have a strong commitment to family values and have a beautiful son named Zachary who was born in 2007. Dr. Conner’s interests include reading the Bible, health and fitness, and playing the guitar as a hobby when time permits. 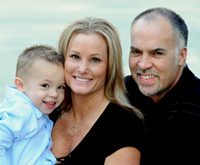 The Conner’s commitment to health and fitness extends beyond the chiropractic practice as they have also been involved in the fitness industry for the past 16 years. Their strong community involvement includes financial assistance to local organizations such as Vacaville Little League, Opportunity House, Vacaville Storehouse, numerous local church functions, Downtown Merriment on Main celebration, local high schools, Boys and Girls Club of Vacaville, Vacaville Girlscouts of America, NorthBay Hospital Hospice, National Diabetes Tour de Cure Research Foundation, Suisun Marsh Wildlife Fund, and many others.